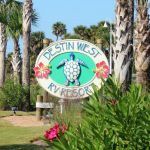 Ask fellow campers about "Destin West RV Resort" and nearby attractions. Our 1st stay was 2013 and have stayed every year since. May be our last stay. I hate to sound cheap, but since 2013 nothing has changed (except addition of community fire pit) except the price. Premium sites 12 and 39 went from $400/week to $740. With zero amenities improvements. Not disclosed on the web site is the 30% deposit, forfeited 30-days in advance. New management needs to get a grip. We camped at Destin West RV Resort in a Motorhome. They try to justify rate increase by pointing at hotel across street with lots of amenities. If you want to schlep all your stuff across the street, have at it. Stayed here for 5 nights in our 5th. Site was adjacent to the pool. Clean, quite (school in session). Everyone was very friendly and polite. Facility was well maintained. Shrubbery around the site was a little tight, brought this up with the management and they were looking at trimming it back. Cable TV quality was poor. Poolside bathroom could use some brighter lights in the shower area. We camped at Destin West RV Resort in a Fifth Wheel. If you are military or government on orders, with ID, they will accept Tax Exempt forms. GPS directions may tell you there is a U-turn involved on Highlight 98, there is not, it is a direct turn in . Use caution as Highway 98 is a " racetrack." Stayed here while visiting the Naval Base and Beach. Sites were nice and roomy and pull in. Could have used a few more bathrooms but they were clean. Nice landscaping and is right on the bay side of the Gulf. Fireworks on Thursday night was good and they rocked the Motorhome they were so close. The beach is across the street and beautiful. If you walk to the beach be sure to take the elevated crosswalk. Traffic is horrible. We would stay again if in the area. We camped at Destin West RV Resort in a Motorhome. Well landscaped with blossoming oleander that provided a natural screen between the campsites. Nice touch. Plenty of palm trees, and green space to walk your animals. Pavers for site parking. Utilities were very close. A gate on the property led next door to an arcade with pizza, boat rentals, wave runners, fishing excursions, catamaran rides along with a restaurant/bar and live music. Paved walkway to the water for launching your kayaks and canoes. The grassy areas as well as paved areas were neat and meticulously maintained. No coins necessary as the laundry machines are not coin operated. They are credit/debit card friendly, which we love. We will be back. The WiFi was adequate for perusing the Internet but not for uploading videos. We camped at Destin West RV Resort in a Motorhome. The facility next door, "Island Time, Boat-Dine-Play" was awesome and easily accessible through the walk-thru gate. We enjoyed food, adult beverages and live music and we were 50 steps from our coach. Half the sites are oriented so that the afternoon sun beats right on the public side of your unit. No shade and not a tree in sight. Poorly designed RV park. Right on the water with nearby restaurant and water related activities. Across the highway from hotel complex that is on the beach and access is included with your stay. Might be the best option for the area, but I'd be unlikely to stay again. Good power, terrible wifi, especially for the price of the place. We camped at Destin West RV Resort in a Motorhome. Fairly small (quarter mile around. Only one loop) but really nice large pads. For our first week we had the best pad on site!! :) It was in the back that faced the ocean and had a huge area of grass behind us. Then we had to move to the front. Still nice and large but you can hear road noise and music at night (at least it stops around 10 or 11) They have a large grass strip going all the way down the middle so you really do have lots of privacy. They only have 2 washer/dryers and the internet was awful. Never could log on. Had to connect to our phones and even that was so slow! They pick up trash all throughout the day and call when you get a package which we really appreciated! 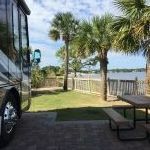 We camped at Destin West RV Resort in a Fifth Wheel. Today is our last day of 2-week stay, our 5th visit to Destin West. I regret to say we spent a half day yesterday looking for alternative CG. The people here remain friendly and accommodating, the pool is wonderful and heated, the park is clean and well landscaped (except for a few bushes the winter freeze got). Ownership has changed. The Fudpucker's restaurant next door (in the past, a source of noise complaints) appears closed and may be converting to a pontoon boat rental facility. The Ramada Inn across the street with its "available facilities to RV'ers" is undergoing a huge renovation and is essentially closed. The big reason we are looking elsewhere: Value. Weekly Winter rates for 2018 are $470/wk. 2019 Winter Rates will be $666/wk, a 40% increase with zero in facility improvements. If you are good with these rates, there are several RV Resorts within a 50-mile radius offering great locations and much nicer facilities. We camped at Destin West RV Resort in a Motorhome. 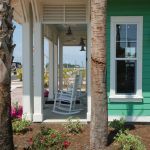 We prefer the shopping and Restaurants found on Hwy 98 east of the Park, specifically Destin, Sandestin, and 30-A. Be prepared for 30+ mile drives and, depending on season, significant traffic issues. I read through 5 previous reviews, they were spot on. This is a very nice park. This is our 1st trip out, and we are pretty happy. The park was landscaping, so there was a lot noise, but the park looks great now. The park next door was empty, so not too much noise, but they are open late and the lights are always on, and keep in mind, this park is on a major road, you hear the traffic the closer you are to the front, and the EMS is close by and you hear them go by a lot. If you are looking for what the others said, great, but hope your not looking for a really quiet park. We camped at Destin West RV Resort in a Motorhome. Conveniently located across the street from Ramada Hotel which offers all its amenities to those staying at this park, including a heated pool. Easy check-in, with friendly staff. All sites are paver based with large patio and landscaping. Good sized lots. Different layout with most outer-loop sites are drive in (not through) with the center sites back-in. We had some noise from the amusement park next door, but not bad. The park is located on a bay, and some sites have water views. We would stay here again. Had no trouble with DISH. There is cable here, but we did not use it. Lots of space to walk dogs. We camped at Destin West RV Resort in a Motorhome. There is no shortage of great food offerings nearby. Many are pet friendly and right on the Gulf Coast beaches. The free Air Force Armament museum was a treat. I'll start with the pros. The staff members and management of this park are exceptional. Friendly, helpful, courteous and accommodating. The facility is located in a perfect location for the Emerald Isle. Close to Destin, Pensacola and Panama City Beach. Close to shopping and entertainment. Across from the Ramada Resort that owns the property and allowed us to use the facilities most of which were not opened due to the winter season. Now, why I didn't give it a 10. We are snowbirds that spend 4 months in Florida so we look for values. Currently they allowed us March monthly rates for 2017 but, will discontinue that for 2018. Spring breakers permit them to charge more per site and that's understandable. Weather is the other factor because, it is sometimes colder than we'd like it. March of this year we just had 30's at night with 50's during the day. February was warmer that that. All and all we loved the park and we would stay here again in a second but, only if they change back to monthly for March. We can not afford the 2000.00 a month rates. We camped at Destin West RV Resort in a Fifth Wheel. The Harbor Walk in Destin for filled with shopping, dining and nightlife. Also one of the best spots to watch for dolphins entering the bay in the evening. Beaches not dog friendly but, some places like the Harbor Walk are. Thank you for your good review and feedback. We're glad that you enjoyed your stay here with us. We hope to see you back again on your next trip to the Emerald Coast! Excellent facility. Well laid out, level paved site with convenient hookups. Easy pull in. Good access from US 98 using left turn lane from divided highway. We camped at Destin West RV Resort in a Motorhome. Thank you for your good rating! We hope you loved your stay here with us, and look forward to your next visit! Our 4th stay. A smaller park, well landscaped, comfortable room between sites even with 45-foot MH's next door. Very clean, trash pick-up from your site several times per day. Laundry facilities and restrooms, while very clean, are small and designed NOT to encourage long term campers. In fact, the more self-contained you are, the better, which means larger, newer MH's, 5-ers and TT's. The heated pool is the social center to meet/greet, or walk your dog on the loop. Only negative is their annual price increases. We camped at Destin West RV Resort in a Motorhome. Within 20-mi east on Hwy 98 or 30-A are tons of excellent restaurants, retail shops. Beach and large "family pool" access at the Ramada across street, reached by pedestrian bridge. Sites 39, 38, 12 are best; sites 2-10 I'd try to avoid. Best place around. The sites were awesome and spacious. The staff was the best, super friendly and helpful. The onsite pool is a little small but you have access to the very large and family friendly pool at the Ramada Inn across the road and also that's were the beach access is. Just an all around great experience at this RV park. 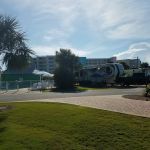 We camped at Destin West RV Resort in a Travel Trailer. Publix grocery is just over the bridge from this park. Also the boardwalk is just across the road with lots of restaurants and shopping. Thank you for your awesome review! We're so glad you loved our resort, and cannot wait to see you back here again! Big rig friendly with level sites. Easy on and of access to I10. Showers and laundry was good. Water pressure was weak at campsite. The beach and several swimming pools were across the road at Ramada Inn which we could use. All sites had concrete pads. No dog park but large field behind camper to walk dog. Park was good for bike riding. No problem using our satellite. 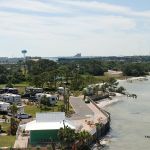 We camped at Destin West RV Resort in a Travel Trailer. Walmart, shopping, and restaurants within 10 miles. Destin was within 10 miles with great beaches. We spent 4 nights in this park in a 45' motorhome. We had a back-in site, in the middle island of the campground. 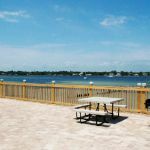 Destin West RV Resort has brick pavers to park on, and for the large picnic table. Each rig is separated by a large mulched bed with shrubbery. There are no trees. It is immaculately maintained, with trash pickup daily. In keeping with the dog-friendly status, there is a walking path around the park as well as grassy strips behind the parking area, which makes total sense when you see it. Rate was a bit high in comparison to other parks in the area, but it is well-lit, clean, and pleasant. There is a heated pool and a fire-pit for community fires on Tuesday and Thursday. We will stay here again. We camped at Destin West RV Resort in a Motorhome. Minutes away from any sort of shopping you might want and multiple grocery stores. The park is affiliated with the Ramada Inn across the street, beach access can be gained by walking or driving across the street. The park is located on the bay. Self serve dog bath, U-Scrub A Pup in Mary Esther, and nice dog park in Destin, came in handy. The Destin "strip" is filled with many restaurants, beachwear shops, and normal resort businesses. Destin Commons is a newer large shopping center about 10 miles to the east. There are several access roads from the north that lead to Destin, but 293 IS a toll road and the total cost for a 3-axle RV towing a car is close to $40. We would have chosen another route if we had known! Destin is a great beach town. Very nice and not at all over-commercialized like some other beach towns. Sugar sand beaches with beautiful blue water. Use the walkway over the busy highway. McGuires Irish Pub in Destin is a must. 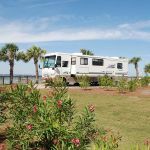 Are you affiliated with Destin West RV Resort ?